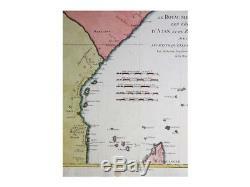 East Africa Old antique map Royaume dAdel Bonne 1787. Title: Le Royaume dAdel: Les Cotes DAjan et de Zanguebar avec Les Etats Qu; Elles Comprennent. Bonne, Ingenieur Hydrographe de la Marine. 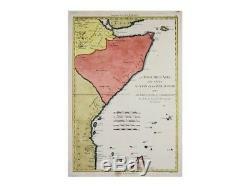 Description: Antique old map of the Kingdoms of the eastern cost of African Continent with a tip of Madagascar. Now known as Somalia, Ethiopia, Kenya, Tanzania, and Mozambique. The map is copperplate engraved with hand coloring and full of details. Rigobert Bonne (France, 17271795) Royal Cartographer to France in the office of the Hydrographer at Depot de la Marine. Origin: Atlas encyclopédique contenant lagéographie ancienne, et quelques cartes sur la géographie dumoyen age, la géographie moderne by Rigobert Bonne and Nicolas Desmarest. 16th -17th -18th-19th Century maps & atlases & prints. We sell guaranteed Absolutely Original authentic Maps and Prints. A Certificate of Authenticity (COA) will be supplied on request. 11 x 15.5 inches. Image app: 23.5 x 34.5 cm. 9.25 x 13.5 inches. Condition: Very good, centerfold as published. All maps and prints are genuine, authentic, published at the date stated in this listing! Always real antique maps - Always original - Never reproductions. For better quality pictures please go to our web site. All maps and prints are genuine, authentic, published at the date stated above. 3 day's Global Express Courier Services on request. 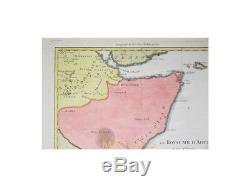 The item "East Africa Old antique map Royaume dAdel Bonne 1787" is in sale since Monday, September 24, 2018. This item is in the category "Antiques\Maps, Atlases & Globes\Africa Maps". The seller is "mapandmaps" and is located in Europe. This item can be shipped worldwide.